The barren, lonely expanse of the Saharan desert is the very last place on Earth you would expect to find a busy city crisscrossed with waterways. But that is exactly what appeared there one night in January 2012. German design team Visual Drugstore brought their innovative MMOVE project to a natural formation in the desert and filled it with a sudden explosion of city life. 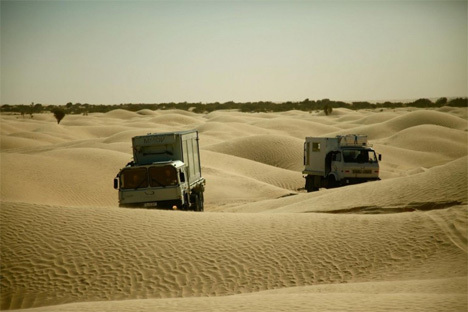 Lumbering through the sandy hills of Tunisia, a massive truck called MMOV (Multimedia Offroad Vehicle) was joined by a fleet of other rugged vehicles on an expedition to a desolate location. They brought with them the type of light, color, movement and life that the area has likely never before hosted. Upon reaching their destination, the team set up shop. They projected all kinds of images onto the rocks and dunes jutting up from the desert, but the most compelling were the scenes of Venice. The natural shelter looked like it had suddenly and spontaneously grown into a fully functional and rather busy city. 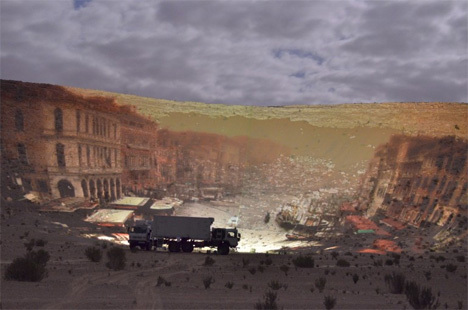 The juxtaposition of the barren landscape with the incredible urban visuals was truly amazing. That odd pairing is exactly what is at the heart of the MMOVE (Multimedia Offroad Vehicle Expedition) project. 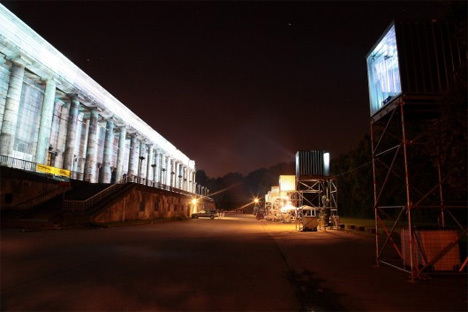 Those lumbering trucks hold hundreds of pounds of video and projection equipment to create entirely new worlds with light. The Visual Drugstore team wants to bring this dynamic experience to more remote locations, but for now they are working on a documentary about the Sahara journey. See more in Art of Tech or under Technology. April, 2012.